Hi there and welcome back. 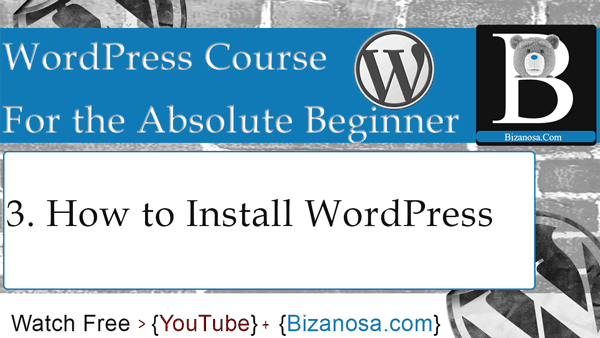 In this video we are going to install WordPress. So, I will go to WordPress.Org and download WordPress. I want to download the zip ; I will click on the blue button. I am using Internet Download Manager so I will let it download the file for me. The Download is complete . I will need to extract it to our Localhost folder. This is how to host a file on your localhost using Xampp . You will need to go to the Xampp folder where it was installed. Mine was installed under local Disk , Xampp. So I will open that. And all the files that you want to view on your browser will be located here. So, this is where you will put the files that are being hosted on your local computer. I want to extract WordPress into this Folder .So I want to extract this WordPress, downloaded WordPress zip file into the htdocs folder. So , I will just drag it inside here. And give it time to extract. Then we will come back and go to the browser and install WordPress. So the file has completed extraction. Here it is. You can rename it. I will rename mine to wp for beginners . This is the structure for the WordPress folder. We have the WP-admin, then we have the includes files and all the other files right here. The themes and plugins are inside the WP-Content folder. So all the plugins will be here. Look at the themes, right now we have three themes available in our Theme Folder. There are times you will need to install a theme by dragging the folder into the theme folder. To view it on the browser you will go to localhost/wpforbeginners . If you chose to use the Wamp Server, you will go to, the WWW folder on the same location where you installed your Wamp. We are using Xampp , for Xampp it is htdocs, for Wamp it will be the WWW folder. So let us go to our browser and install WordPress. So we will go to Localhost/wpforbeginners . If you named yours differently, put that name here. This is the setup. You will need a database, we have already created a database. You will need a username , the username is available by default if you did not change anything after installation, the database password, and the database host. So lets go. So, our database name, I gave it the name wordpress.If you gave your database a different name, input that name there. For the username,if you did not change anything after installation, the username will be root. If you did not add a password, then the password by default is blank. Database host, leave that at Localhost. Then the table prefix, I will change mine to w3p. You can change this, or not . I recommend and urge you to change this to something else. Then I will submit. Thats it. Run install. If you experience any errors just check whether the database name was right , the username was right .Those are the two important ones. So here you will give the website a name. Site Title, for us is WP for Beginners. Password… I will use this weak password because this is on my local computer. However, in a real website, I would not be using such a weak password. You can use a stronger password if you want to. [email protected] . Privacy, Allow search engines to index this site. Im on my local computer, so this does not really matter because search engines are not going to access my local computer. However if you are creating a website that you want to be indexed immediately, you will leave this selected. I will just install WordPress. And that’s it. You can choose to log in. Our username was Bizanosa, and the password was also Bizanosa . So here is the Dashboard . We will continue from here in the next video. If you have experienced any problems, google for a solution because all systems have different or may have different configurations and that might bring different problems to different people. So, if you experience any errors, just go to Google.com and search for a solution. Okay, this will mark the end of this video , in the next video we will take a look at the DashBoard overview . We will look at all of the things that we have here . See you in that video.